With Tuesday being the last day to file nominations for the Lok Sabha elections, political bigwigs cutting across party lines made a beeline to file nominations. BENGALURU: With Tuesday being the last day to file nominations for the Lok Sabha elections, political bigwigs cutting across party lines made a beeline to file nominations. It was a day of political rallies as popular faces like JD(S) state president and former prime minister H D Deve Gowda filed their nominations to contest the Lok Sabha polls. Massive rallies were held in Tumkur, Mandya, Hassan, Bangalore Central, Bangalore North and Mysore seats as key contenders from BJP and Congress-JD(S) combine filed nominations. In a show of strength to rival the crowds that gathered at Sumalatha Ambareesh’s rally on the day she filed nominations, JD(S) organised a massive roadshow for coalition candidate Nikhil Kumar in Mandya. The mammoth rally saw Congress’ D K Shivakumar join in a show of coalition solidarity. Despite rebellion from Congress’ incumbent MP Muddahanumegowda, who filed nominations as an independent candidate, Gowda made his contest from Tumkur official. 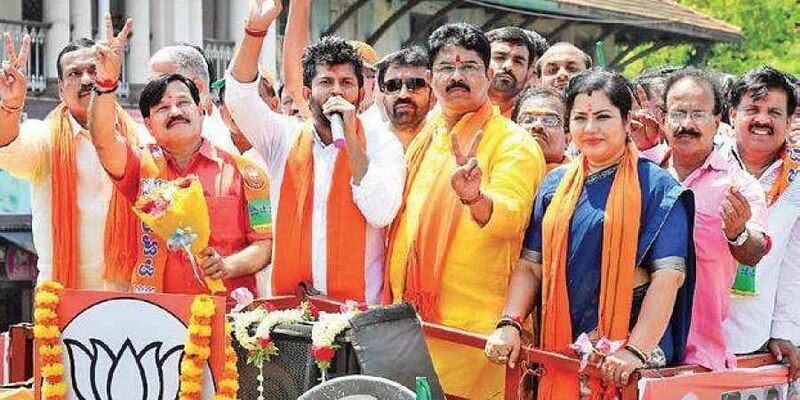 The BJP organised a massive roadshow in Hassan as its candidate, Congress turncoat A Manju, filed nominations to contest against Deve Gowda’s other grandson Prajwal Revanna. Theatrics took prominence in Hassan with Manju choosing to wash the feet of civic and sanitation workers before filing nominations on Monday. Prominent faces of Congress and BJP filed nominations on Monday, considering it an auspicious day. Incumbent MP from Chikkaballapur Veerappa Moily, B N Chandrappa from Chitradurga, Kolar’s K H Muniyappa and Chamarajanagar’s Dhruvanarayana filed nominations. BJP’s MP from Mysore-Kodagu Pratap Simha, D V Sadananda Gowda from Bangalore North and Dakshina Kannada’s Nalin Kumar Kateel too filed nominations. BJP’s candidate from Chitradurga A Narayanaswamy, Congress’ candidate from Bangalore Central Rizwan Arshad were the others. A former minister in the Siddaramaiah cabinet, Pramod Madwaraj filed nomination as a JD(S) candidate from Udupi-Chikmagalur constituency. In all, Monday saw 109 candidates taking the total number of nominations to 181.